The Article: We’re Not a Christian Nation by Fred Rich in The Daily Beast. On this July 4, 2013, we live in a country where our fellow citizens have a dazzling diversity of religious beliefs (and non-belief), and most of them do not present any threat to our democracy. But one influential strain of Christian fundamentalism, which insists most loudly that we are a “Christian Nation,” has a vision for America that is profoundly theocratic. So if you want to engage in a small but meaningful patriotic act this Independence Day, you might want to educate yourself about what the “Christian Nation” movement means, and what our country might look like if the “Christian Nation” vision were to be realized. 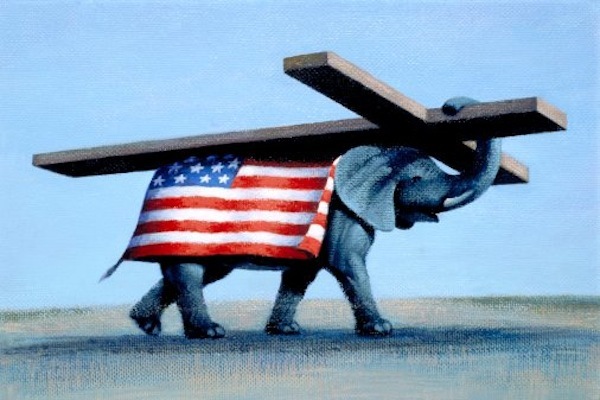 In the “Christian Nation” these Americans envision, Christianity enjoys a uniquely privileged legal and political position; separation of church and state is anathema. Christian pseudo-historians like David Barton, together with fundamentalist legal “scholars,” thousands of home-schooling educators and many Christian broadcasters, relentlessly promote the message that church-state separation is a “myth” concocted by liberal elites to deflect America from realizing its true destiny as a “Godly Kingdom,” where the Bible is the highest law of the land, and our political leaders talk to God and tell the rest of us what He says. Millions of nonfundamentalist evangelicals are increasingly bombarded with the fundamentalist message that the architects of our Constitution really intended to give birth to this sort of “Christian Nation,” a message that is usually supported by highly selective quotations from the “Founding Fathers.” This message is manifestly untrue. Our Constitution does not contain a single mention of God. Instead, the great innovation of our Founding Fathers was to abolish the Old World system where deviation from the religious beliefs of the State or monarch was not tolerated. Rejecting this model, the founders gave us a secular republic where religious minorities benefit from guarantees of freedom of worship, conscience, and speech. Despite its patent fallacy, the impact of the “Christian Nation” revisionist history on American attitudes is substantial. Recent evidence of its success includes a YouGov Poll conducted in April, which found that 34% of Americans were in favor—and 20% were strongly in favor—of establishing Christianity as the official religion in their state. You read that correctly: 34% in favor of establishing Christianity as the state religion. These numbers were no surprise to me. In the course of researching my novel, Christian Nation —a work of speculative fiction in which McCain/Palin win the presidential election in 2008 and Sarah Palin becomes president when McCain dies in 2009—I learned that the religious right’s base of support remains remarkably steady, virtually uninfluenced by the ups and downs of national politics. For over a decade, polls consistently report that 30-40% of our fellow citizens self-describe themselves as “born again” or “evangelical,” and report their belief that all of the Bible is literally true and that Biblical prophecies set forth a specific sequence of end-times events, likely to occur within their lifetimes. Their leaders control both the vast Christian broadcasting movement and much of the Republican Party at the precinct and state level. The Pew Forum on Religion and Public Life estimates that groups representing these citizens spend about $390 million each year to lobby the government to impose their religion-based agenda on the rest of us, making the Orwellian argument that their own religious freedom requires the rest of us to live our lives in accordance with the dictates of their own religious beliefs. This strain of Christian fundamentalism is not disappearing and, despite the recent successes of the marriage equality movement, in great swaths of the country they are winning the “culture war” they have fought for 30 years. Our Founding Fathers knew how dangerous theocracies could be. They gave us a constitutional democracy in large part to protect minorities from the yearnings of a religious majority. This Independence Day, their design of a secular state, with no religious belief receiving preference over any other, should be celebrated common ground for all Americans, whether conservative or liberal, religious or secular.